The UK government has published a "future partnership paper" as it works towards ending the direct jurisdiction of the European Court of Justice in the United Kingdom after Brexit. So what does the ECJ do, and why is it so important to the Brexit process? 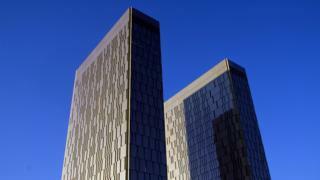 The Court of Justice of the European Union - to give it its full name - is the EU's highest legal authority. It is based in Luxembourg. It is actually composed of two separate courts - the Court of Justice and the General Court. From 2004 to 2016 there was a third court, the Civil Service Tribunal, but its work is now done by the General Court. To avoid confusion this article will refer to the European Court of Justice (ECJ) to describe the work of the entire institution. If you want to know more detail, or look up a specific case, you can do so here. The European Court of Human Rights (ECtHR), which is a separate institution. The ECtHR is based in a different city, Strasbourg, and is not part of the European Union. It is the ECtHR not the ECJ that has often upset British politicians by making it harder, for example, to deport terrorist suspects. The ECJ has tended to support British efforts to extend the remit of the single market. So what does the ECJ do? Why has it become so controversial in the Brexit process? It all comes back to that Brexit referendum slogan "Take Back Control". At the Conservative Party conference in October 2016, Theresa May, as the new prime minister, declared: "We are not leaving (the EU) only to return to the jurisdiction of the European Court of Justice. That is not going to happen." Vague promises to take back control of our laws suddenly became a very specific promise to end the jurisdiction of the ECJ in the UK. It became a government red line. So what? I thought we could do a trade deal with the EU without direct ECJ involvement. Yes, we can. That's because trade deals usually have their own inbuilt dispute procedures. But any company from the US or Japan or anywhere else that wants to sell its product in the European single market has to comply with all EU regulations, and with all ECJ rulings about any of those regulations. If foreign companies don't comply, they can't operate in the EU. The same applies in reverse, of course, to European companies that want to sell their products elsewhere. So foreign companies can't escape the jurisdiction of the ECJ? Not if they want to operate in the single market, no. They are not immune from EU law. Quite the opposite, in fact. Take Google for example, which was fined a record 2.4bn euro by the European Commission in June for abusing its dominance of the search engine market. If Google wanted to appeal, it would have to make its case before the European Court of Justice. But even if UK companies had to do that in the future, it still doesn't mean the ECJ would play a role in the UK, does it? In that sense, no, not directly, because companies can choose whether they want to trade abroad or not. But the really difficult issue for any country that wants to "leave" ECJ jurisdiction entirely is that the European Court is the ultimate arbiter for all the rules and regulations that make the EU tick. So if the UK wants to stay in the European Air Safety Agency, or the European Arrest Warrant, or the European Medicines Agency or any number of other bodies that regulate various aspects of our lives, it will have to accept that the ECJ will have a role to play in UK affairs. Here's one illustration of how thin this red line can be. Since the referendum, the government has confirmed that it still intends to join a new Unified Patent Court that is being set up by EU member states, even though the new court will regard ECJ decisions as legally binding and refer its own legal questions to the ECJ. In other words, only a completely clean break gets rid of the ECJ entirely? Yes, that's right. Every time you dig beneath the surface of Brexit you stumble across the European Court of Justice. To get rid of it entirely would mean cutting all the ties we have, setting up dozens of regulatory bodies of our own, and starting many things from scratch. Also, don't forget, if the UK wants to negotiate a period of transition, to smooth the path towards full exit from the EU, it will have to accept that the writ of the ECJ will continue to run for quite some time after Brexit. And what about the rights of EU citizens in the UK? That's another policy area in which the role of the ECJ will have to be negotiated. The EU insists that its citizens in the UK should continue to enjoy the legal protection of the ECJ even after Brexit. UK negotiators say that is not acceptable, partly because it is a commitment that would have to last for many decades in some cases. People on both sides of the Channel hope it is, at least in some respects. On the citizens' rights issue, for example, there are suggestions that some kind of independent tribunal, involving both EU and UK judges, could be set up. There are some precedents for this. Similarly when it comes to the single market there are parallel structures such as the EFTA Court (which governs the affairs of Norway, Iceland and Liechtenstein, the three non-EU members of the European Economic Area) that are nominally independent of the ECJ. But in practice, the EFTA Court follows ECJ rulings extremely closely. The UK could in theory set up something similar. The EU may be ready to live with that, but ardent Brexiteers will raise objections. That's one of the reasons why David Davis has spoken of a 'new and unique solution' - he has to try to keep everyone happy! The trouble is that legal issues such as jurisdiction are extremely difficult to fudge, and there does appear to be a substantial gap in perception between the two sides. David Davis has made the sporting argument that if you're Manchester United and you go to play Real Madrid, you don't let Madrid nominate the referee. But the EU sees the footballing metaphor rather differently: the UK is choosing to leave a league of 28 teams. If it wants to come back to play the odd friendly, the EU would argue, it has to accept that the panel of referees will remain the same.